It is advertised that regular service will resume on December 29th. Actually that's one of the few complaints I had about this place. 5 to be exact; shall we get them out of the way, in a classic bad-news-first way? 1. The aforementioned lack of a comprehensive English website. 2. Not enough showers. Maybe 30 sit-down and only 12 standing ones. Even on a Thursday evening, there was a short queue at times to rinse off. 3. Sauna is well-lit... A little too well. It's like a doctor's exam room in there! 4. A couple of times while in the jjimjilbang rooms, I heard water rushing through pipes somewhere. Not so relaxing. 5. Minor, but it was kind of hard to find a water machine to fill up my bottle. Get yours filled in the sauna. OK, there. The band-aid's off. Now for the good stuff. This place is (as expected) gorgeous. What I didn't expect was for it to be so different from any other jjimjilbang I'd been to. Instead of being just an up-scale version of a nice jjimjilbang, this is like stepping into a 5-star, ultra-modern hotel. 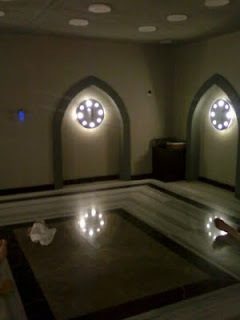 Cool, flat stone; glass partitions; restrained decorative appearance; and plentiful meditation areas distinguish both the sauna and jjimjilbang from others I've reviewed. An open floor plan and high glass ceilings also lend themselves to the modern aesthetic. At first, you'll notice the grand lobby welcoming you to buy a ticket. It will cost you 12,000 won for a visit on a weekday, 14,000 on Saturday or Sunday (4 hour limit). You may notice the lack of screaming, running rugrats. The first real advantage of this spa: no children under 13 are allowed in. This most certainly improves the overall peace. As a side note, there's no sauna-only ticket option, so everyone gets 3 extra fluffy towels and a set of clothes. The locker room isn't really much different from another nice sauna's locker room. The lockers are full-size, and have shelves and a jewelry rack inside. In the bathing area you'll start to notice the stark beauty and opulence of the place: lots of small baths, each of a different temperature. In the center of the room are the naturally-fed hot springs. One is sodium chloride (salt, benefiting the muscles and joints, as well as other body systems), the second is sodium bicarbonate (baking soda, said to "improve beauty of the skin"). Both have the added benefit of reducing the amount of water absorbed by the skin due to higher concentrations of salts in the water, so you don't prune up! Now that's nice-uh! There are also a massaging tub (around 38* with varied positions and a cave), a cool tub (~25*), a cold tub (18*), 2 dry sauna rooms, and an outdoor spa (women's sauna only). Outdoors are two more naturally fed pools. They are pretty hot - welcome this time of year, though. The outdoor area is covered by a slatted wood dome to maintain privacy. Hint 1: Next to the entrance from the locker room, they provide soaps and natural sea salt to scrub or soak your skin with, and all showers are stocked with shampoo and body wash. Hint 2: You can pay for anything in the jjimjilbang with your locker key, so don't bother bringing any money up. Once you venture down the hall towards the jjimjilbang you'll be transported to the hotel I was talking about before. Let me just list the rooms available to you here, with some description. Yellow Ocher Room - Hwang-to / 황토방. Hot, but comfortably dry. Hammam Room - 하맘룸, meant to replicate a Turkish-style bath sauna. Bali Room - 발리룸, an open area with soft floor-mattresses where you can congregate with your friends and loved ones and talk freely. Pyramid room - angled walls for a relaxing mood, or something. Roman Room - 로만룸, replicates the feeling of a traditional Roman sauna room. Warm and very humid, like Korean summers. Stand over the steamer in the center with your towel over your head for max effect. Body Sound Room -raised platforms which vibrate with the bass in the calming background music. Bonus fake bamboo along the walls. Wave Dream Room - places to lay along the sides, and from the middle lights are reflected through water waves for a meditative, colourful view on the ceiling. 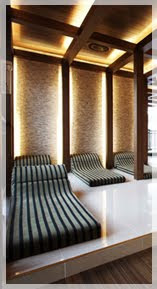 SEV Room - therapeutic ions emitted into semi-private, wooden 2-seater benches lit by dim coloured lights. 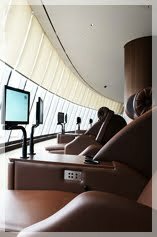 Relax Room - an amazing 3-tiered arc-shaped space with reclining leather chairs together by two's, each one equipped with it's own mini TV! Outdoor foot spa - In the chilly months, don one of the quilted jackets at the entrance to this patio with various temperatures of walking- and soaking-foot-tubs with seats for small or large groups, singles, or couples. 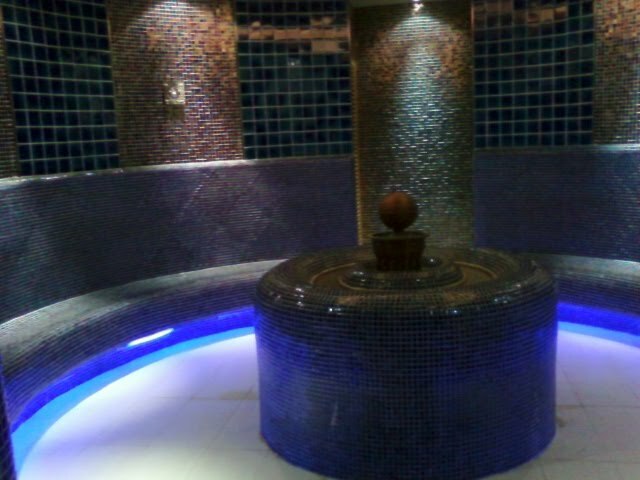 Massage & Therapy, nail shop, cafe & beverages, restaurant, DVD, PC, business rooms. Yeah, that's all. Ha! I only got lost a couple of times. The restaurant is opulent and offers some great cuisine other jjimjilbang don't (udon with fried Japanese things, bulgogi stew, even the simple Korean foods are high-quality) the therapy room looks top-notch, and the DVD theatre is also fitted with reclining chairs. Premium. I highly recommend this place for a special treat - best enjoyed with friends, guests, or in a couple. Off you go! 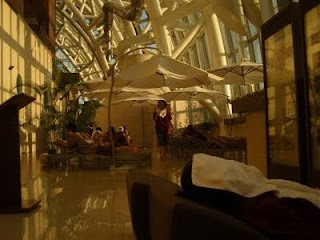 Shinsegae Spa Land - right outside the Centum City subway stop on line 2, exit 12. Shinsegae Department Store (Centum City location) - English, basic, but has a cute map. Used to be nicer when it first opened with more different wet sauna rooms in the female section. Now they have changed the configuration to accommodate the increasing number of visitors. Also travel packages start to include tickets to Spaland.. meaning there will be newbies who didn't take a shower before they jump into the hot spring. In Kyobo bookshop they have a pile of Spaland 20% discount voucher, upstairs in the sauna area, more and more gimmicky chairs/ beds are being installed to generate extra revenue like colour plus sound beds, oxygen cabins and forest cabins. Spaland is fast becoming a victim of its own success and soon to be a tourist hot spot rather than what it used to be a very relax chilled out posh Jjimjilbang.